As the industry adopts new technologies such as IoT, 5G and AI, fog computing has likewise been rapidly increasing in popularity because it fills a necessary gap. In fact, fog is a critical architecture for these emerging architectures because it enables reliable, low-latency operations and removes the requirement for consistent cloud connectivity. Fog provides the missing link in the cloud-to-thing continuum. 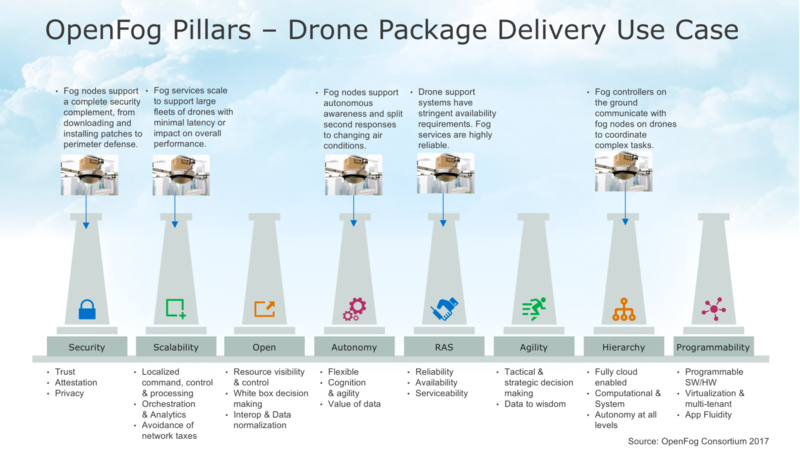 To illustrate the value of fog, let’s investigate the network logistics of package delivery via drones. This is an ideal example because it’s an emerging industry that just a few years ago seemed futuristic, but now, thanks to fog and other enabling technologies, it’s not only realistic, it’s imminent. There are business plans for drone mail and product delivery on boardroom tables of some of the biggest companies in the world. Fog will make the concept a safe and profitable commercial reality. Here’s how. Fog architectures selectively move compute, storage, communication, control and decision-making closer to the network edge where data is being generated. This solves the limitations in current infrastructures to enable mission-critical, data-dense use cases. 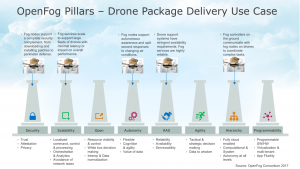 Drone package delivery requirements are applied to the eight pillars of the OpenFog Reference Architecture. Fog is an extension of the traditional cloud-based computing model where implementations of the architecture can reside in multiple layers of a network’s topology. These extensions to the fog retain all the benefits of cloud computing, such as containerization, virtualization, orchestration, manageability and efficiency. The computational, networking, storage and acceleration elements of this new model are known as fog nodes. They comprise a fluid system of connectivity and are not completely fixed to the physical edge. Now let’s overlay fog to the use case of drone-based package delivery. 1. Drone hub management. As drone delivery takes off, it will become impractical for every vendor to have an independent fleet that operates independently of every other fleet on the planet. To scale drone use, the industry will need to develop drone hubs that can coordinate the flights of many companies, much like airports do. Managing these hubs with advanced technologies is critical in order to coordinate drone activities with traffic and operations on the ground and in the air. Fog computing controllers on the ground will communicate with fog nodes on drones to coordinate the complex, split-second coordination of landings, takeoffs, loading, unloading and maintenance. 2. Collision prevention and safety. Shared airspace is the only way to arrive at high-scale drone delivery services. When there are only a few thousand drones in the air, there may not be much concern about collisions. When there are millions, however, there will be a very real threat of drones crashing into each other (and into birds, airplanes and tall structures). Unmanned vehicles will need a way to recognize unforeseen collisions and make course alterations in sub-milliseconds. 3. Bandwidth bottlenecks and expense. Whenever a drone is being prepared for a delivery or is in transit, constant communication and tracking is required. This translates to a constant stream of data for every drone flight. Access to the cloud may require expensive satellite links in remote areas, making some commercial applications cost-prohibitive. Fog computing solves the many problems of communications, storage and computation with the speed necessary to safely control high-volume drone traffic. Fog computing provides for a more efficient way to upload continuous software updates, massive amounts of data and other computational and communication requirements. 4. Security on the ground and in the air. Imagine hackers targeting and rerouting drones carrying medical supplies, drugs and even data. Adding security features such as encryption and anti-cloning chips on multiple sensors will increase the cost of the drone. Downloading security credentials, patches and updates from the cloud to the drone can consume valuable bandwidth. A fog node on a drone can handle security, without adding complexity, size or cost to any other drone parts. The fog node can take care of security updates even in mid-flight. It provides a full complement of security measures, from downloading and installing patches to perimeter defense. 5. Autonomous operation. Because drones are unmanned, they require sufficient on-board intelligence to act with autonomy when needed. Fog computing includes autonomous response: the ability to take the appropriate automated corrective action sequence. Fog nodes on the drone can provide awareness of anything within close proximity to the drone — including weather conditions, other drones, birds or buildings. Fog nodes also provide analysis and sub-millisecond response to changing conditions in the air. Trying to make this loop through the cloud would take far too long. Fog-based drone delivery will extend the reach of delivery to inaccessible places and greatly reduce the customer wait time between order and delivery. With fog, drone fleets will realize their potential to reduce costs, congestion and environmental impact. In addition, fog will help drone delivery create new markets that simply aren’t practical with traditional vehicle fleets. To access the OpenFog Reference Architecture, which provides a high- to medium-level overview of systems architectures for fog networks, please click here.